BOS may be over, but Bushwick never stops making art. 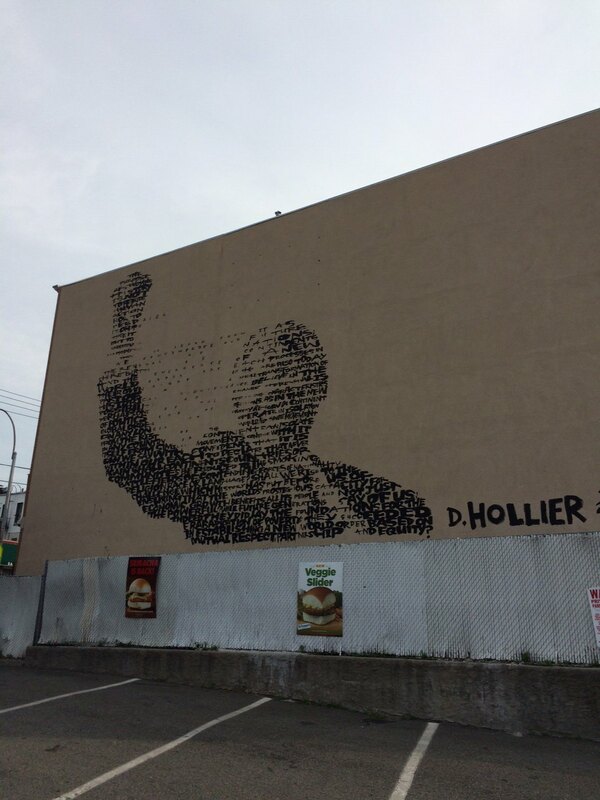 This morning, commuters walking to the subway station at Myrtle-Wyckoff were greeted with an impressive new mural of Nelson Mandela that appeared overnight on a building that borders the parking lot of the White Castle on Myrtle Avenue and Linden Street. The mural is made of up words that, viewed from a distance, sketch out the unmistakable image of a triumphant Mandela raising an arm skyward. It was apparently done by the artist David Hollier, who has created quite a few word-based images of popular figures in a similar style. Hollier tweeted updates about his progress and posted the finished product to Instagram this morning. Can we say with confidence that it is within our reach to declare that never again shall continents, countries, or communities be reduced to the smoking battlefields of contending forces of nationality, religion, race, or language? Shall we rise to the challenge which history has put before us, of ensuring that the world’s prodigious capacity for economic growth benefits all its people and not just the powerful? Will future generations say of us: indeed they did lay the foundations for the eradication of poverty; they succeeded in establishing a new world order based on mutual respect, partnership, and equity? The open space surrounding the mural will allow it plenty of visibility to pedestrians walking down Myrtle Avenue and riders on the elevated M-train line, giving Bushwick residents a daily dose of inspiration for, hopefully, years to come.